The late actress/entertainer Judy Garland is beloved on an international scale, and especially so among the LGBT community. And no one does Judy Garland quite like Kimberly Roberts. I first saw Roberts appear as Garland in the The Judy Monologues at Toronto Fringe – and was struck by how much Roberts was able to convey of Garland throughout a completely silent performance. I had the great pleasure of seeing Roberts perform in The Get Happy Hour with Judy, in the second of two World Pride 2014 Toronto opening night shows at Revival Bar last night, and it was the first time I’d heard her speak onstage. Written by Roberts and Sephera Giron, and directed by Sarah Strange, The Get Happy Hour with Judy is part multi-media theatre/part cabaret/part TV show. Roberts plays both a Garland impersonator named Kimberly Williams and Garland herself in this largely one-woman show. Jamie Johnson plays the affable Bartender and accompanist, and Stuart Park guests as the Drunk and the Announcer. The action shifts from Williams chatting with the bartender about Garland and her cancelled TV show, and the two share an appreciation of her work even as they ponder the tabloid reports of self-destructive behaviour. Williams chooses to see the positive side of Garland, though, and imagines how successful her TV show would have been if it had been set up as a happy hour, with people talking, drinking, performing and enjoying. Complete with vintage black and white TV commercials, and a slide show of Garland family photos. This is where Roberts really gets cooking. From there, the show launches into the TV program that never was, imagined by an actress sitting in a bar, chatting with a bartender over a martini: The Get Happy Show with Judy. Garland tells us about her early days in the business and shares stories about family, highlighted by the song choices (which Roberts expertly lip-syncs), including some rarely heard gems that will thrill Garland fans. It’s more than the fact that Roberts is a remarkable look-alike. Every expression, from the mouth to the eyes, every gesture is nuanced and precise. The warmth and vulnerability behind the powerful voice and stage presence is palpable. And that’s why people love Judy Garland. 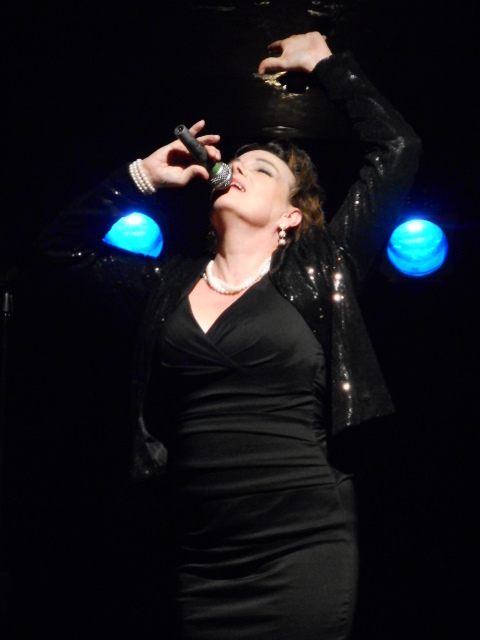 Roberts doesn’t play Judy Garland – she channels Judy Garland. You have two more chances to catch The Get Happy Hour with Judy during its Pride run: tonight (Wed, June 25) at 7:15 p.m. and 10:15 p.m. You can also follow and like The Get Happy Hour with Judy on Facebook. If you’re heading over to Revival Bar, you might also consider getting there early and taking in JJ Marie Gufreda’s Left Hander in London: The Earthquake, based on Gufreda’s book about her transition from a “Joe to a Jane,” which is touring with The Get Happy Hour with Judy and has performances at 6:00 p.m. and 9:00 p.m. on June 25. I caught the end of the show last night – and it promises to be a funny and poignant experience. p.s. – Love how The Get Happy Hour with Judy gang includes their favourite Judy Garland song in their bios. Mine is “The Man That Got Away.” What’s yours?